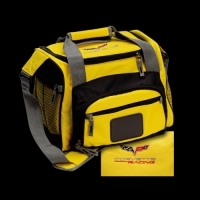 CORVETTE RACING DUFFLE COOLER RUGGED DENIER POLYESTER, INSULATED, REMOVABLE WATERPROOF LINING IN MAIN COMPARTMENT. TWO ZIPPERED END MESH POCKETS AND TWO ZIPPERED FRONT POCKETS, 12 CAN CAPACITY. EMBROIDERED CORVETTE RACING EMBLEM. 13”L X 9”W X 9”H COLOR: YELLOW. IMPORTED.